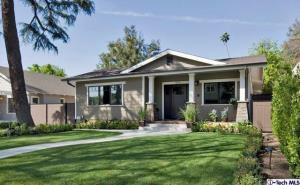 Beautiful California Arts & Crafts style home extensively redone in 2015 offers classic architectural charm coupled with the best of today's modern amenities in the coveted South Pasadena school district. Featuring 4 bedrooms and 4.5 bathrooms over almost 3,000 sq. ft., this lovely home offers an open floor plan splashed with generous doses of natural light. A gourmet kitchen offers quartz countertops, cast iron farm sink, built in Thermador refrigerator, six burner gas range, large center island and much more. The home also features a large family room flowing seamlessly from the kitchen, two master suites, engineered wood flooring, backyard patio and much more. All plumbing, electrical and HVAC completely redone in the remodel. From top to bottom, an exquisitely designed home perfect for California living. Welcome home..